the husband is in Las Vegas (onbusiness)(foraweek) which means two things…a) something is going to go very, very wrong and b) someone is going to barf. exhibit a. exhibit b. exhibit c. exhibit d. I will stop exhibiting now, and get to the matters at hand. the matter of the little colossal leak from my waching machine to my basement carpet. oh yes, having someone come and rip the damn drywall apart in your basement is exactly the sort of thing you hope for when you are trying to sell your house. then there’s the camera situation. my lens broke on my Nikon, which of course sent me into a fleeting tizzy, which the husband took in to get fixed (warranty, yo!) only he couldn’t find what he’d done with the warranty, so he thought, lo! I will just wait until I get back from Vegas and Ali can use the canon point-and-shoot….only the canon point-and-shoot’s battery charger has flown the coop. no where to be found. cue ali’s shakes. oh, and then we must discuss the laptop that the husband took with him on his trip. the one that has ENCHANTED and PETER PAN on it…the two movies we have on lather, since, repeat these days, especially when Isabella decides to traipse into my bed at 5am. stream a little Gisele through the laptop and through the Xbox for her, and presto! 2 more hours of sleep! and helped me remember WHAT IS REALLY IMPORTANT because right now, i wish that my dear friends Heather and Mike only had missing movies and broken camera lenses and leaky washing machines and barfy kids to worry about. I put Peter Pan on for Oliver when he was sick a few weeks ago and he asked me what an injun was and I had absolutely NO IDEA what to tell him. No idea. 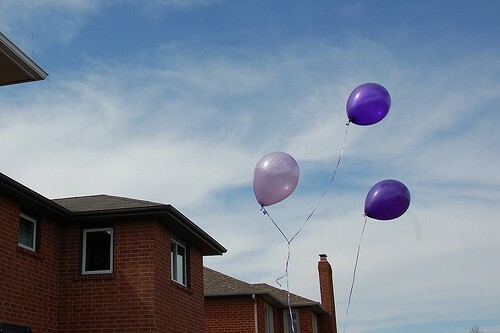 Those purple balloons were a beautiful way to honour Maddie. What great friends you have. My inappropriate childhood literature was Noddy – they were British kids’ books, and I don’t think they were so popular this side of the pond. However their treatment of black people was, um, less than acceptable. So yesterday I was at my brother’s and he started watching Enchanted. And I said “has Skyler (my 3 1/2 year old niece) seen it?” He said no because she only likes cartoons. She then proceeded to sit in front of the TV barely moving, loving the movie. And yes, I now refer to you as just a friend and not a blog friend. Don’t you feel special? My laptop and car only break down when my husband is out of town. It’s like it knows when I’m alone and vulnerable. 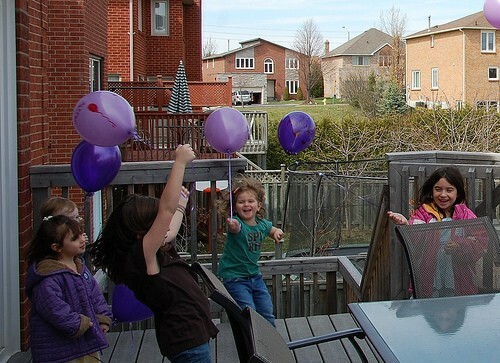 awww.. those balloons are a wonderful way to honour Maddie’s memory. hush about the missing husband mini-catastrophes. Thanks for the heads up on Peter Pan, we are still stuck on Sleeping Beauty as our sleep aid (which is kinda funny now that I think about it) but I don’t need to be explaining any more UnPC stereotypes thankyouverymuch. We had our first encounter with The Little Drummer Boy stop-motion movie which was just completely yikes. And perspective indeedy, you are a great friend Ali. The purple against the sunny skies is striking and beautiful. And sad. Confession – I’m a little bit glad my kids have outgrown animated Disney movies. The downside, though? Beverly Hills Chihuahua. Dear heaven, that movie is pffft, which is what I thought your ‘bff’ said at first glance! fadkogs last blog post..orange you glad i didn’t say banana? The balloons were just lovely, Ali. And for the record, our furnace broken the one time Graham was gone away over night. It’s the way of the world. We just watched Peter Pan last week, and I, too, was a little startled by the injun scenes. Also, Peter Pan? Total womanizer! Those mermaids were a lot more nekkid than I remember. uhm.. Peter Pan is one of my favorite cartoons… and that song is possibly the most politicial incorrect Disney song out there… which is probably why I find it hysterical. Nice article – I really liked it. So true…and really, what is up with Peter Pan? What you did for Maddie was BEAUTIFUL…. With the kids and the friends…. Really special…. Sometimes I forget you live in a real adult house with children. There’s nothing quite like racism targeted at the preschooler set, is there? Fortunately, we haven’t gotten to Peter Pan yet. Oh, man. I totally remember that song from Peter Pan. Although I guess, coming, as it did, from Walt Disney, we can’t really be surprised. Heh. The balloon release was BEAUTIFUL. Such a sweet tribute.